For more than 30 years, segmental retaining walls (SRWs) have been a first-rate choice for a variety of projects because they are aesthetically pleasing, durable, flexible and structurally sound. Since their introduction in the early 1980s, the specifications, design, construction and inspection of SRW systems has evolved, creating new and improved practices to install these systems successfully. 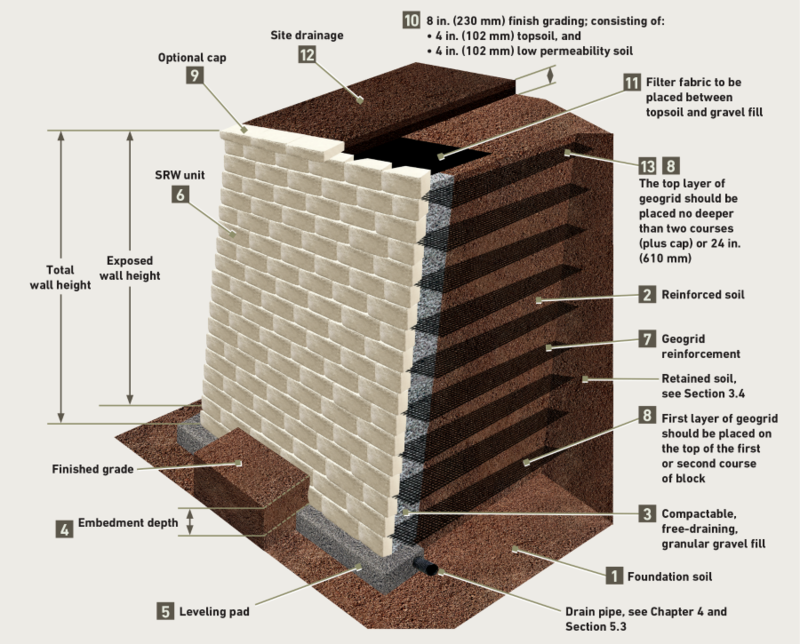 The National Concrete Masonry Association has compiled these new practices in the Segmental Retaining Walls Best Practices Guide for Specification, Design, Construction and Inspection of SRW Systems, published in 2016. The recommendations in this Guide are the most up-to-date recommendations for installing and specifying SRW systems published by the industry, and intended for applications where an SRW design engineer is needed, and only covers reinforced SRW applications. As such, the Guide does not cover conventional (gravity) SRW or DIY residential applications, or small projects where an engineer is not required. In addition, the Guide is intended to provide recommendations and should not override engineering decisions, as different projects have unique conditions. This article is provides a brief overview of the Best Practices Guide. A diagram of a typical reinforced SRW is show in Figure 1. As shown, there are several components that comprise the SRW system, including the SRW units, geosynthetic reinforced soil, gravel fill and more. Ensuring that quality materials are selected, proper construction techniques are followed and effective inspection is performed are all necessary for a successful project installation. The Best Practices Guide provides recommendations in several areas, detailed below. Successfully installed SRW projects depend on clear roles and responsibilities for the owner, site civil engineer, SRW design engineer and SRW installer. Prior to the initiation of a project, the owner should work with the SRW design engineer to establish the scope of responsibilities and understand the limits of the SRW design engineer’s responsibilities. The design engineer is responsible design of all aspects of the SRW within the design envelope. The Best Practices Guide provides recommendations on the scope of the design envelop, and these are shown in Figure 2. SRW Units – recommended properties for units depends on climate condition and expected exposure. For example, units used in applications where they will be exposed to deicing salts (such as near a roadway) will have more rigorous criteria than those used in applications without salts or in areas where freezing conditions are not encountered. Geosynthetic Reinforcement – specific recommendations are provided for polyester geogrids, including use of materials that have been submitted to the National Transportation Product Evaluation Program (NTPEP) for Geosynthetic Reinforcement (REGEO). This program provides an independent, third-party product evaluation service and on-site geosynthetic plant audit to ensure the product reviewed complies with all industry requirements. In addition to the recommendations shown above, the Best Practices Guide details enhanced design recommendations for special situations, such as high ground water table or tiered walls. Recommendations also include suggested safety factors for design, minimum recommendations for geosynthetic reinforcement length and maximum vertical reinforcement spacing. Water and drainage are also very important for long-term performance of SRW systems. 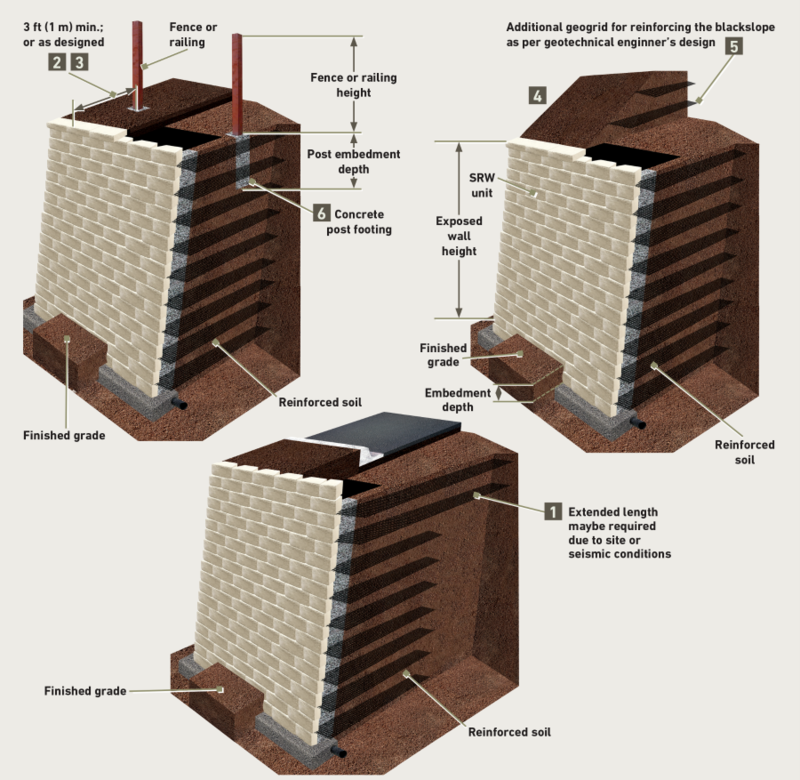 Recommendations include overall site drainage and surface water to direct this away from the SRW structure rather than behind, and use of blanket and chimney drains when necessary (See Figure 3). A successful SRW project depends on not only sound design, but also good workmanship practices during the construction phase. The Best Practices Guide contains detailed recommendations on construction, including selecting an NCMA Certified SRW Installer (or equivalent certification), The Installer Certification Program requires a minimum level of SRW construction knowledge, completion of an examination and proof of installation experience and ongoing continuing education to ensure that certified installers can complete a job correctly. Other construction recommendations include unit placement, compaction tasks and water management during construction. Inspection of SRW construction shall include the review of plans for conformance to building code standards, onsite inspection for approval of the subgrade soils when the leveling pad is installed, onsite compaction testing during construction, and certification of the completed wall by the engineer of record, confirming the construction followed the design specifications. The Best Practices Guide includes a detailed construction and inspection checklist for use on SRW projects. Also included in the Guide are recommendations for a variety of special applications, including tall walls (over 10 feet tall), terraced walls, water applications, seismic considerations and above wall considerations (see Figure 4). SRWs provide a cost-effective alternative for grade changes on site and are a value-added option to the site. Careful design and construction can ensure that the SRW gives the owner the high quality, long-term performance expected. Readers can download a free copy of the SRW Best Practices Guide here.